I was expecting really big things out of this book, and to be honest, I was a little disappointed. The first few essays were about Augusten’s childhood and were admittedly chuckle-worthy. They involved a life-sized wax Santa with a half-eaten face and a gingerbread public housing unit. But as the book progressed, the stories became more and more melancholy. He described his drunk Christmas spent with bums in New York City, and an affair with a fat French Santa. Overall, the book lacked Augusten’s usual sharp wit and eye for hilarious details. I wouldn’t recommend spending $21.99 on the hardcover version. With my Barnes and Noble member’s card it was $18 and some change, still a little steep. Maybe it’ll be out in paperback next year. 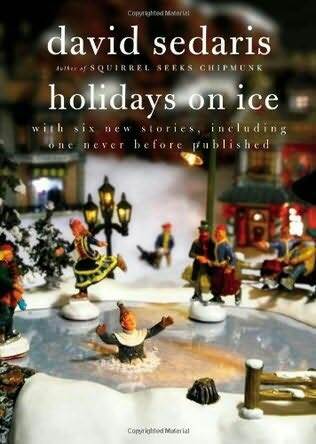 If you’re in the mood for a little holiday absurdity, I recommend reading “Holidays on Ice” by David Sedaris. The best part is, you can buy it used on Amazon for $1.89. This entry was posted in Books and tagged Augusten Burroughs, Barnes and Noble, book, bums, David Sedaris, disappointed, drunk, essays, gingerbread, hardcover, holiday, Holidays on Ice, New York City, paperback, review, Santa, You Better Not Cry by Sarah. Bookmark the permalink.